Released as a short-run private press LP in 1965, 'Fate Is Only Once' has long been a coveted collectible among American Primitive guitar enthusiasts. The album presages the broader movement. Acoustic musicians were still largely stuck in a rigid "Folk" mindset in 1965, and there are just not that many other examples of the exploratory guitar sounds found on 'Fate' during this time period. Alternating between haunting originals and jaunty blues-based traditional numbers, this absurdly rare LP was reissued by Tompkins Square in 2006. Taussig's only other recorded works appear on the long out-of-print Takoma compilation 'Contemporary Guitar Spring '67' alongside John Fahey, Robbie Basho, Max Ochs and Bukka White. Taussig spent years as an educator, published instructional guitar books, and traveled extensively to photograph weird museums. 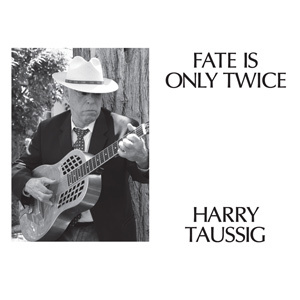 Amazingly, he returns with his first album in 47 years, appropriately titled 'Fate Is Only Twice'. The same stark, smoldering playing is evident, all the humor and inventiveness intact.